Heading out of the beach town, Stone Harbor, the Stone Harbor Boulevard cuts a thin strip of road through a salt marsh. It's a beautiful, mystical strip, dotted with marinas, crab shacks, farmer’s stalls, and stilted houses with docks jutting out into the high cordgrass. Bull sharks have been known to swim here and the place rivals the tropical rain forest for biological diversity—facts that verify what I’ve been feeling for years: the salt marsh holds a beautiful mystery; pockets of Jersey rival the world’s most alluring spots. 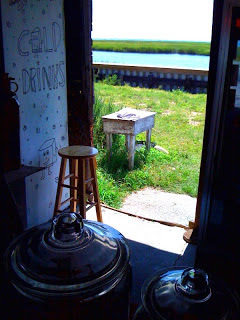 This summer Karen snapped a picture of the back doorway of Tim Rush Farm’s Country Food Market. The salt marsh is framed in the doorway like a blue river with low green banks. I look at it when I feel wistful. Jersey, I sometimes think, rivals any place for pure, summery beauty. The summer's over, I know, but I'm still feeling the sharks in my heart. Today, a balmy October Sunday, I pulled a chair out in the sun and sat in my skimpy bathing suit reading F. Scott Fitzgerald's biography. My tan has not yet faded. This was a momentous summer for me; a weird summer, in ways; but ultimately the best summer of life. I graduated from my writing program in Asheville. I read a selection from my novel in front of about 100 people--the people I most admire in the world, my peers, my friends, my wife, my brother, and my mother. Later, to celebrate, my wife cut a rug with James Franco. Karen and I drove away from Asheville, circuitously, up the Blue Ridge Parkway, and then back, and then we hit the road home. It was mid-July. The sun on I-81 was dazzling and tremendous. I felt like I was not only driving home, but into the heart of my summer. A few days later we ate a celebratory meal with Sue and Andrés, friends from Barcelona--great friends whom we see maybe once a year. We drank too much wine. On a dare, I sprinted around the length of Rittenhouse Square--in just over two minutes. In late July, we went to Borgata. A group of us waited in line outside the Gypsy Bar. Karen, the center of the group, tethered us together with her irresistible buoyant mood. She assured us we had no place in the world to be because we were the world. We were the party. I looked around at the people looking at us and I believed her. Inside Gypsy Bar, we danced. The band sang “Don’t Stop Believing” and I crooned loudly from the center of the dance floor. Later, we drifted into Carina, where, after watching Karen try on a slew of extravagant dresses in the dressing room, we tousled on the carpeted floor, bedazzled dresses strewn around us like luxurious bedsheets. Looking at myself in the dressing room mirror, something broke within me: I felt unusual and damaged, but fine with it, and suddenly Atlantic City became a new scene. Then there was a Saturday in August, Karen and I sunbathing on one of Stone Harbor's tight beach plots, the waves rolling in between the jetties. I went for a dip in the green water. I swam for about an hour, bodysurfing the little waves, wading over the red swaths of seaweed on the ocean floor. From time to time, I'd look up into the clear sky and see a single-engine plane trailing a banner. Then there was an epic walk on the beach with my Dad. A weekend at the Cogan's beach house. A brisk Saturday morning in Cape May. We walked out of breakfast and into a parade. Chris Cogan hadn't slept for days. He felt, he said, "Like hot garbage." I burst into laughter. It was August. I remember missing the moment as it happened. Goodbye, summer. Be still, my shark-filled heart. Ellen Vitola here, please accept Jessica Nelson as a new friend on facebook so that she can experience your work as a fellow writer. I sincerely enjoy your thoughts in words on just about everything and I know that she will connect with you. She also lived in Asheville while doing a workshop and has writtnen some wonderful pieces. She now lives in New York and is working on her masters. Thanks, my best to you and the lovely Karen. Cogan is onto something about the "hot garbage" emotion. A bad pizza is like a circle of hot garbage, and booze is also associated with feelings of hot garbage. Excellent writing, as always. Congratulations on completing your writing program! And props for not giving up on the novel. One day I'm going to walk into a Portland bookstore and buy it. And then I'll mail it to you covered with ridiculous annotations. PS- I just had this fantastic Chilean Carmenere from Casillero del Diablo. Try it if you can. Congratulations on graduating the writing program. I hope to read some of the output of that experience. I enjoy the exuberence of your writing and as always have a light sense of envy at your apparently charmed life -- no, at what you make of your regular life; that is more true. You are a joyous person Seth, and one with the gift of sharing that joy. I miss you.